Depart Adelaide at 9am on your journey through the northern suburbs and past the Riverland towns of Blanchetown & Waikerie. Our first stop for today is at Kingston on the Murray to visit Banrock Station and the wetlands. Here, you will have an opportunity to stroll along the boardwalks built across the wetlands which have been developed to attract birdlife back to the area. Enjoy a close up viewing of the river birds which have returned to the river wetlands. Continue to Renmark for our lunch stop before crossing the Murray River & the Victorian border and arriving in Mildura. After breakfast, we begin a sightseeing tour of the beautiful city of Mildura. The city was originally established as the first irrigation colony in Victoria. Due to its hot dry climate, Mildura mainly relies on its water supply from the mighty Murray River. Travel along the city’s wide boulevards and see the numbered streets – a legacy from the city’s founder, W.B. Chaffey. Chaffey was invited to Mildura by the Victorian Government to establish a network of water channels to begin fruit growing in the area after working on irrigation in California. Today’s touring includes a drive along the stunning river front area, followed by a visit to Rio Vista – Chaffey’s original residence. The home has been established as a museum that is furnished in the period of the day and includes many interesting items from Mildura’s past. Later, we board the historic PS Melbourne Paddlesteamer for a memorable 2 hour cruise. 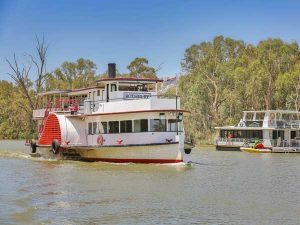 During the cruise, hear interesting stories about the river’s fascinating history and the colourful stories of the Paddlesteamer trade in the past. You will also experience a unique event as you are lowered through Lock 11 on the Murray River. Light lunch will be available for purchase during your cruise. After your scenic cruise, we travel to the famous Woodsies Stone & Gem Workshop near Irymple. The shop is an Aladdin’s cave of treasures and is home to one of Australia’s largest jewellery collections. Crystals & gems from all over the world can be seen here! During your visit, you may wish to enter the crazy maze garden covered with over 200 types of flowering creepers. After breakfast, we set off crossing the bridge over to Buronga & Gol Gol in New South Wales. We pass an area tagged by locals as “Millionaires Road” which consists of a group of beautiful houses built along the river bank, mostly with private boat ramps onto the river. Our tour then continues past orange groves & avocado plantations along the Murray Valley Highway. Travel past the small soldier settlement of Robin Valley where many soldiers who returned after WWII were repatriated by the government. Then, continue to Boundary Bend before crossing the river to Toolebuc, where you will have the opportunity to purchase lunch at the local Sports & Services Club. Later, we tour some of the country roads in the area to Manangatang, a small rural town made famous by legendary football commentator Lou Richards when describing a poor football performance saying “the side coudn’t even beat the Manangatang thirds!” Our tour then continues via the spectacular Hattah National Park past the Red Cliffs & Irymple on our journey back to Mildura. 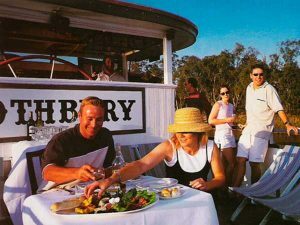 Travel along the River Road to the old soldier fruit growing town of Merbein before heading across to Wentworth. Located on the junction where the famous Murray & Darling Rivers join, Wentworth was once one of Australia’s busiest river ports. A busy customs house once operated here due to the large volume of freight which was checked as it was transferred between Paddlesteamers which traded along the two rivers. This was the only jail and the main lock-up facility for the area up to Broken Hill. Later, we travel to the Orange World Orchard with over 10,000 Citrus trees planted varieties including mandarins, oranges, grapefruit & avocados. Enjoy a tracker train ride through the orchard before stopping for afternoon tea including delicious Dutch pancakes. This evening, enjoy a relaxing evening dinner cruise aboard the Paddlesteamer Rothbury, cruising upstream from Mildura while enjoying a spit roast carvery dinner. Live entertainment is provided giving patrons the opportunity to dance if they choose, or to merely sit back & enjoy the tranquil floodlit river banks created by the PV Rothbury’s powerful floodlights. After arrival back at the Wharf, we tour back to our accommodation for our overnight stay. After breakfast, we depart Mildura & the Sunraysia area and begin our journey back to Adelaide. We travel back past Lake Cullulleraine then over the border into South Australia near Yamba. Stop in Loxton with time to buy lunch – we recommend purchasing a fresh lunch from one of the town’s popular bakeries and eating it in the beautiful picnic gardens nearby. We continue our journey home through Karoonda and via the Adelaide Hills to arrive back in Adelaide at around 5pm. You will be dropped off at your hotel in Adelaide at the end of your tour for your overnight stay. The next day, enjoy a full day at leisure to explore Adelaide and South Australia. Ask us about optional tours that are available today including day tours to the Barossa Valley, Adelaide Hills or the McLaren Vale wine region. Alternatively, you may wish to take a stroll down Rundle Mall or visit the Adelaide Zoo and the Botanic Gardens. Later today, a chauffeured car will take you from your hotel to Adelaide Airport in time for your flight back to your homeport. Flights are included from all departure cities shown as required. These are based on Virgin Australia ‘V’ Class Economy airfares, and are subject to availability at the time of your booking confirmation.